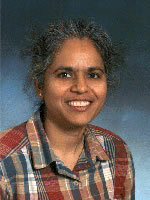 Dr. Shubha Kadambe obtained her PhD EE from the Univ. of Rhode Island in May 1991. Since then she has had held various research positions at A. I. DuPont Institute, At & T Bell laboratories, Atlantic Aerospace Electronics Corporation and HRL Laboratories, LLC. Currently, she is a program officer at Office of Naval Research, Arlington, VA where she manages the signal and image processing and understanding program. Currently she also holds a visiting research associate position at the Mathematics department, University of MD, College Park where she conducts research in the area of "bio inspired intelligent algorithms". She has extensively worked in the areas of speech, time-frequency representations, advanced signal and image processing, and bio-medical signal processing. She has over seventy technical papers, one video tutorial, six invited chapters and one monogram (to be published by John Wiley) in these areas. Her biography has been included in Who's-who in America and who's-who of American women published by Marquis in 1998, 2002 and 2003, respectively. She has served as an associate editor for IEEE Transactions on signal processing and as a member of technical committee of several international conferences. She has also chaired several technical sessions in various international conferences. Her research interests include time-frequency/time-scale and their applications to speech, sonar and radar, speech, neural networks, bio inspired signal/image processing and non-linear signal processing. She has recently been elected to the grade of senior member of IEEE by its officers and board of directors in recognition of professional standing. She was an adjunct professor at the University of Maryland Baltimore campus (UMBC). She has taught graduate and undergraduate courses at UCLA, UMBC and California Institute of Technology. She has guest lectured at the University of Southern California.